Some badminton news now. PV Sindhu finally broke her own jinx, pulling off a shock win against top-ranked Tai Tzu-Ying of Taiwan at the BWF World Tour Finals in China. World number 6 Sindhu is part of tough group at the tournament where her opponents included Tzu-Ying, Zhang Beiwen and Akane Yamaguchi. 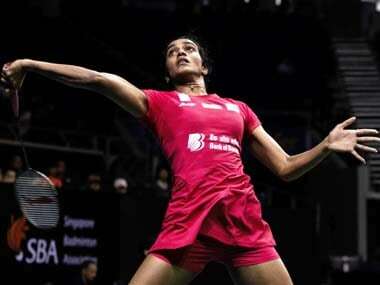 On Thursday, Sindhu defeated Tzu-Ying 14-21, 21-16, 21-18 in 61 minutes of the most thrilling badminton. The come-from-behind win was special as it came against an opponent whom Sindhu has not won against in their last six meetings over two years. Sindhu defeated Akane Yamaguchi in her opening match, making this her second impressive win at the tournament. Football news now, and let’s take a look at the results in the Europa League. Greek club Olympiakos defeated AC Milan 3-1 on Thursday, which meant the seven-time European champions Milan crashed out of the Europa League. Elsewhere, Eintracht Frankfurt fans ran riot during the German side's win at Lazio. In Rome, football hooliganism was on display once again as five Eintracht Frankfurt fans were arrested in clashes with police ahead of their dead-rubber Group H match against Lazio. As many as 9,000 Germans swamped the Stadio Olimpico. Eintracht comfortably lead the group after winning all five previous games, while Lazio also qualified for the last 32 regardless of the result of the match. Eintracht won the match 2-1. However, their fans stormed the pitch after the opening goal in the 56th minute by Joaquin Correa of Lazio. They also threw smoke bombs and flares at Lazio fans as well as the police.